“Row, row, row your boat, gently down the stream”. In our case, stream translates to the Atlantic Ocean and by boat, we’re talking about a 200+ metre long, 30 metre wide freighter weighing in at just shy of 45,000 tons, with all her cargo. My bike Pearl has an engine that’s 520 times less powerful to the on board reaching 25,000 bhp. 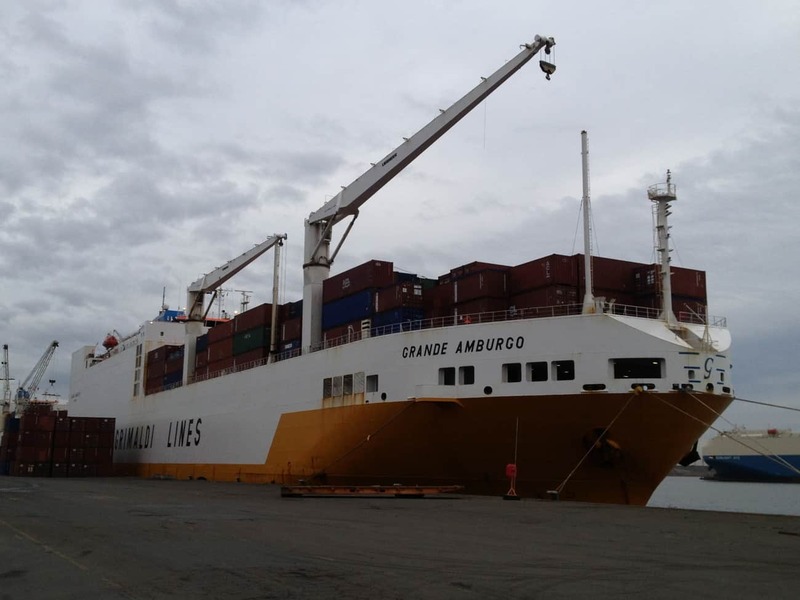 Meet our magnificent vessel – the Grande Amburgo! The pair of us set off from Surrey, our temporary home after vacating our rental property two weeks previous. After a heavy-hearted farewell to family, we jumped on the bikes to kickstart our journey. 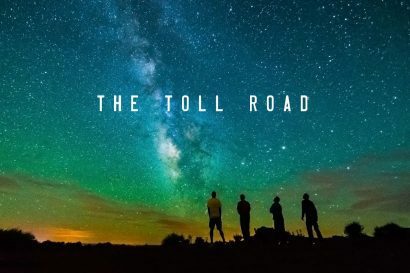 It was a wrench to go but I was on the edge of the unknown about to embark on an adventure, and that eased the pain of leaving everything I loved. Admittedly, I was a bag of nerves but excitement jostled for my attention more. 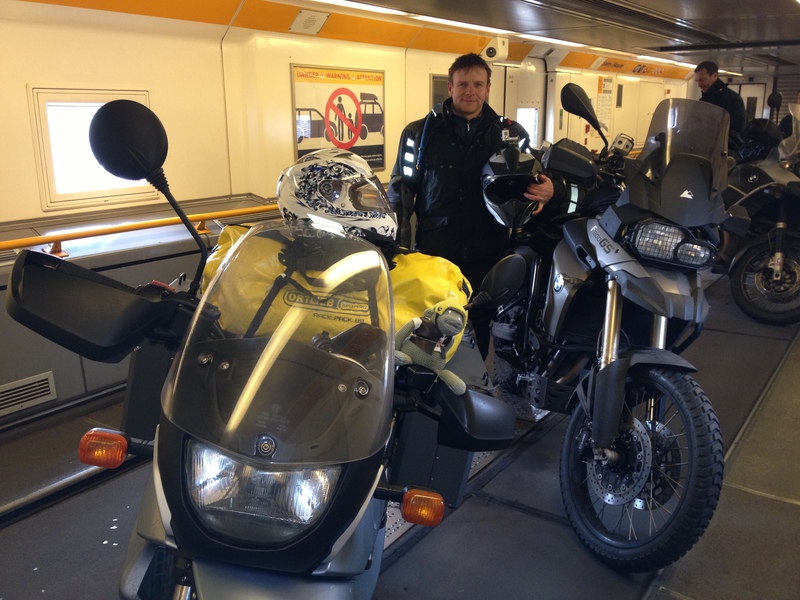 Although a little wary of keeping Pearl, fully loaded, upright – being able to reach the Eurotunnel in good time and remembering to stay on the right from Calais to Antwerp – dominated my thoughts more. These concerns railroaded my mind, which coupled with rush hour, any road works or breakdowns with the bikes put me on edge from the outset. Entering the port in Antwerp and heading in the general direction of our vessel was a spectacular sight. All around us thousands of brand new JCB, CAT and Volvo machinery, super-sized Tonka toys, excavators, cars, vans, trucks, lorries, even a fire engine and train carriages were being loaded in dock. 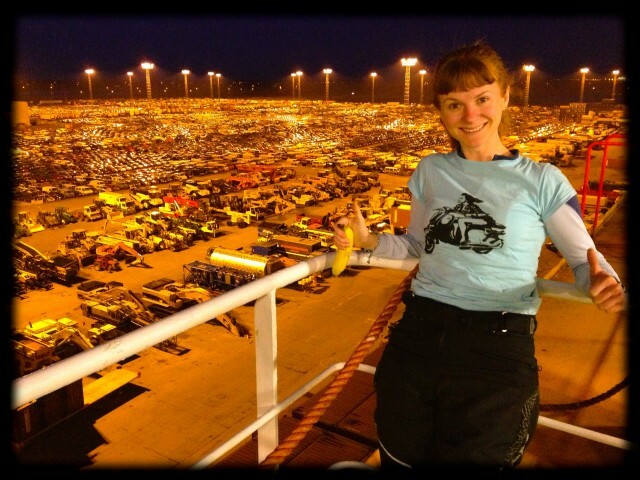 When it came to our turn, my jaw was dropped the whole time we rode into the boat’s back entrance up to our allocated cargo deck – we were on a road, the vessel was that big! We parked the bikes up alongside rows upon rows of expensive cars removed all valuables from the bikes after they were strapped down and it was as easy as that. The Grande Amburgo was a working vessel for a male crew of twenty-eight, Italian and Filipino as well as a floating hotel that accommodated four passengers including a friendly French couple. We quickly settled into our cabin made more comfortable with en suite, a TV screen and DVD player. Knowing that passengers were secondary to the cargo, I didn’t quite know what to expect on board. We quickly realised there was a strict hierarchy on board; anything needed we went directly to the chief mate, second in command to the captain. Within the first few days of being on the voyage, the novelty of getting to know a ship this size was oodles of fun. ‘Hide and Seek’ anyone? We explored all thirteen decks and climbed 178 steps although the elevator remained appealing. Neither of us relished getting stuck inside the lift so on the stairs our burning thighs remained. I’m not sure if it’s because we were used to boats from dive guiding in Egypt years ago but it was pretty easy to tune out of the ship’s sounds, accept her gentle movement in our stride and easier still to forget that we were even at sea. It was one big vessel and it would take a boisterous sea to make her pitch wildly. I curbed any complacency creeping in when the chief mate told us that five containers were lost overboard on the voyage before ours, the sea was that rough. Sailing through the Bay of Biscay, we absent-mindedly forgot to let such notoriously choppy waters affect us. As it was blowing an absolute hooley outside, we took an invigorating walk on the top deck instead and marvelled at the strength of the gusting wind. We were introduced to the captain, Carlo. An amiable enough man who authoratively informed us that we were not to absorb his crew in chitchat. Understandable, there was work to be done. The days passed well, which at a cargo ship’s pace of around 17 knots steadily merged into weeks. We learnt a little Spanish with Rocco, the cook, which unveiled a ludicrously large language gap we needed to close should we ever wish to converse on Latin American turf. There was time. 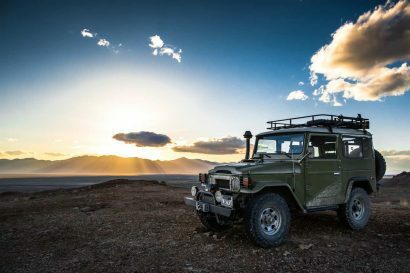 We were almost Dakar bound. Most of our time on board this ‘poor man’s cruise’ was spent inside the spacious and airy passenger mess room – researching Argentina and Chile, particularly Patagonia; devouring novels; trying to keep supple for the two-wheeled trip ahead with a spot of yoga and getting some light exercise inside the small gym. After the first few days sailing, the cooler temperatures were replaced with a hot sun interspersed with a couple of monsoon rainstorms. Most evenings we hit the top deck for some dramatic stargazing. It was a real treat with no light pollution; some stars were the size of solar systems. We often spotted a shooting star and the odd red supergiant, a Betelgeuse – no doubt millions of light years away but couldn’t quite get my head around looking up into the past. Eight days in, we dropped anchor to spend the afternoon in Dakar. Back at our anchored sanctuary, we encountered a throng of burly Senegalese men in their grubby high-vis jackets emptying cars from the top cargo deck. These were lads having a right hoot on their employer’s time. Bursting with bravado, one signalled me for a cigarette, cash and carnal pleasure – NICE! Another wanted to marry me – dream on, sunshine. Just as we wondered how to stave off potential cabin fever half way through the crossing, the captain organised a tour of the bridge to watch the momentous crossing of the equator, an unofficial, one-off look at the bow as well as a visit in the ear-piercing engine room. Any fleeting feelings of confinement we had disappeared into sea air. Back at the bridge, the crew responsible for navigation astutely relied on paper charts more so than their computerised-counterparts. I followed the pair of compasses down the chart on our line of travel and counted how many hours over the nautical miles required until we reached the southern hemisphere. On the equator, we watched the GPS eagerly count down from N 0.00.0001 to S 0.00.0001 – a big moment. Happy New Year! – we shouted in unison. What with the tropical rain now spinning anti-clockwise down the ship’s drain-holes and never-ending flying fish accompanying us, life was never dull at sea. 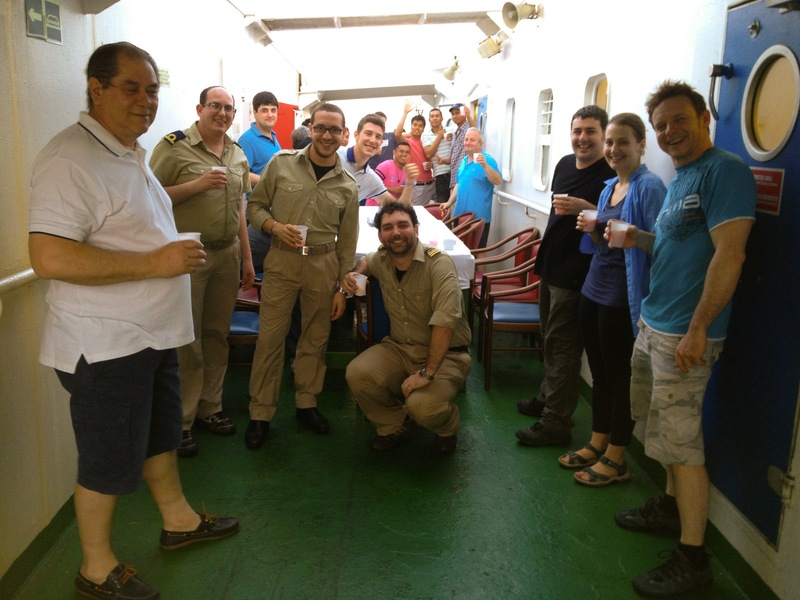 In order to mark our equatorial passing, the Captain deemed an al fresco party was in order. In a hushed awe, we glanced up and saw Neptune, Lord of the Seven Seas. Grinning through a thick beard made from a mop’s strings, Neptune looked the part in an old sheet tied with rope at his waist. I loved Neptune’s fork made from aluminium foil, it flashed in the setting sun inducing a certain je ne sais quoi. Fantastic effort. The ceremonial baptism commenced and both the Captain and Neptune presented each passenger with a certificate celebrating our equatorial crossing. Upon my baptism, I bowed before the marine lord and he poured a ladle of holy water over my head. Reborn, my new name was ‘Shaula’ and Jason in his sacred ritual became ‘Merak’. The shindig festivities commenced straight away, everyone was famished. It took three days to construct the barbeque from scratch using an old oil drum, having watched the guys take pleasure out of creating, welding and fixing it together in the baking sun for hours. We tucked into barbequed meats, salads, rice and ice cream. Rocco, the Italian cook and his team had outdone themselves. The moon hung low over the sea, ripening toward full. The crowd-pulling music was blaring full blast and before we knew it, we were dancing the night away having fantastic fun with the crew. 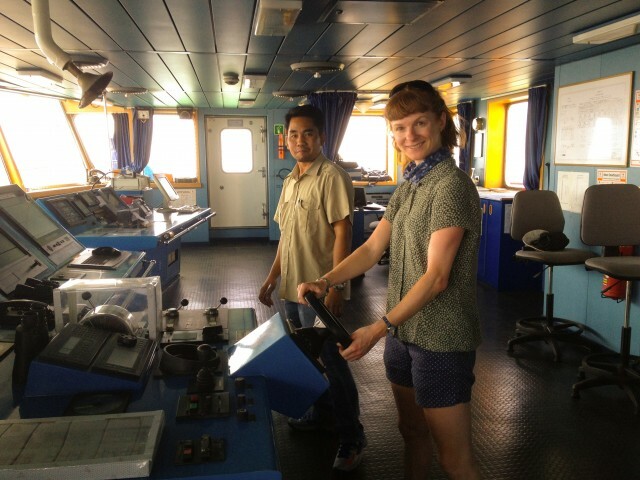 It also gave us an opportunity to establish more about life at sea, away from loved ones for months on end. Excruciatingly challenging but a sacrifice still worth making all the same; at least perhaps on a financial level for those back home. I understood better why there was such strong camaraderie bordering on brotherhood amongst the crew; working day in, day out, with the same men for months on end. It seemed to me these seamen were blessed with two sets of families. Land ahoy matey! 6,906 nautical miles sailed and we finally arrived at large to Uruguay’s capital Montevideo brimming with that just-rolled-off-the-ferry feeling. Would we recommend the ‘ride on, roll off’ experience prior to a big motorbiking trip? Absolutely! 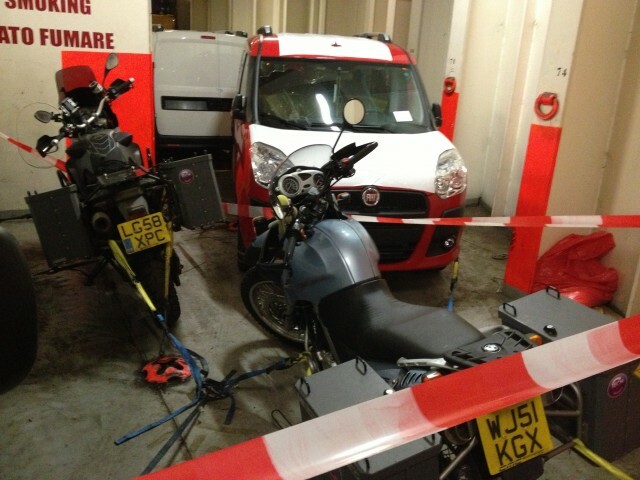 Despite a little petty theft to our bikes in the cargo deck from external dock people coming on board to unload cargo – and in hindsight we should have asked for a cage to secure our bikes – the sailing was otherwise seamless and uncharacteristically smooth. 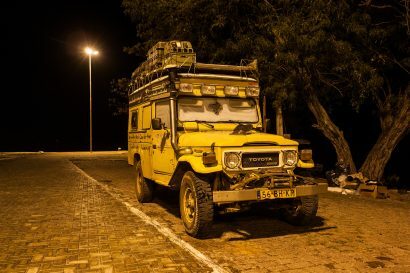 Over a 27 day crossing incurring only a two day delay, we’d stopped off at Dakar, Santos, Paranagua and Zarate to stave off getting fathoms deep in boredom. 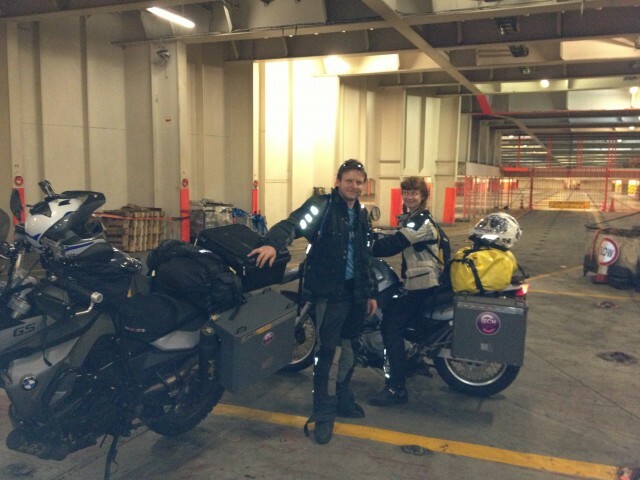 We saved a fair bit of money compared to flying our bikes and us, the paperwork on arrival at Montevideo was a breeze to process and within half an hour, we were on our way. A terrific way to start our two-wheeled adventure!